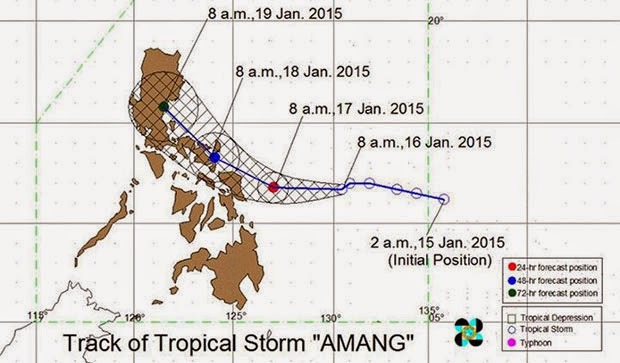 Tropical Storm Amang 2015 is expected to make landfall this weekend. Here's more of the detailed forecast from state weather bureau PAGASA. As of 12 p.m. Friday, January 16, the eye of Bagyong Amang was spotted 542 kilometers East of Borongan City, Eastern Samar, packing maximum sustained winds of 75 kms per hour near the center and gusts of up to 90 kph. It is forecast to move West at 15 kph. 24 hour (Tomorrow morning): 180 km East of Borongan City, Eastern Samar. 48 hour (Sunday morning): 40 km Northeast of Legazpi City. 72 hour (Monday morning): in the vicinity of Baler, Aurora. 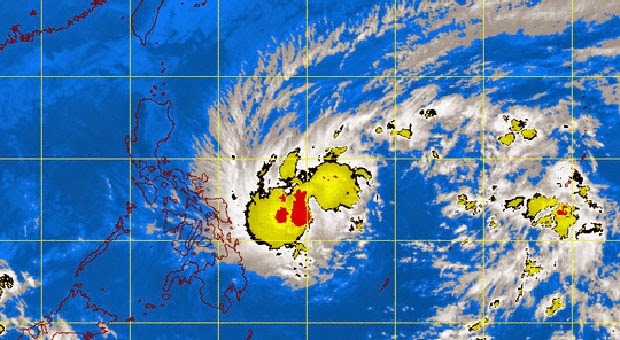 Bagyong Amang may hit Northern Samar tomorrow evening, PAGASA noted. Public Storm Warning Signal number 1 (winds of 30-60 kph is expected in at least 36 hours) is up over Camarines Sur, Catanduanes, Albay, Burias Island, Sorsogon and Masbate including Ticao Island, Northern Samar, Eastern Samar, Samar, Biliran and Leyte. The weather agency said the estimated rainfall amount is from 7.5 to 20 millimeters per hour (heavy to intense) within the 300-km diameter of the Tropical Storm. Residents in low lying and mountainous areas of the provinces with storm signal as well as Samar and Leyte provinces are alerted against possible flashfloods and landslides. PAGASA warned that ocean waves may reach up to 6.5 meters. Fisherfolks and those with small seacrafts are advised not to venture out over the seaboards of Northern and Central Luzon and the Eastern seaboard of Southern Luzon, Visayas and of Mindanao. In the next 6 hours, state forecasters said there is a possibility of raising the PSWS over Camarines Norte, Marinduque and Southern Quezon.